This official Bear will become the mascot for your Bunco group. This Party Bunco® Bear travels with the hostess and usually hibernates in the Bunco Box until the next Bunco night™ game is announced. It arrives wide awake and ready to be tossed, or thrown from table to table as any Bunco enthusiasts rolls three of a kind and yells ... BUNCO.!!!!! 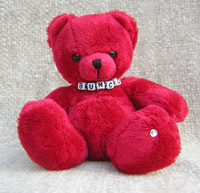 Like all past Bunco Bears ... we are special...order now!! !